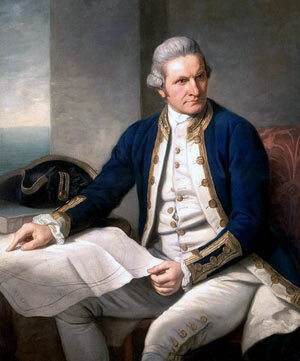 Official portrait of Captain James Cook from the National Maritime Museum, United Kingdom. © Public domain. James Cook, English naval captain and explorer, sailed on the ships Discovery and Resolution on his final voyage of exploration along the west American coast and up to Bering Straits as far as 70°41’N with the hope of finding the Northwest Passage. There he ran into ice that stretched as far as he could see, demonstrating the separation between the Asian and American continents. It was on his way home from this voyage that he met his death in Hawaii after he tried to recover one of the Discovery’s boats that had been stolen by the natives.